Do you ever see something online, or on Pinterest and refuse to believe that it is as easy as it looks/other bloggers say it is? That was me with Homemade Butterfingers. I love Butterfingers in that weird kind of way where you really like them but you forget that you like them until you have one. You know? I would never buy one or think about eating one unless there happens to be a bite sized or mini one in front of me and then it's like "where have these been for the last 3 months?" I mean have you checked out my Butterfingers Cake? When I joined Pinterest a year or so ago, I kept seeing all these pins for Homemade Butterfingers. People would have the pictures captioned with things like "so easy!" and "only three ingredients!" but in my head I was like "YEAH RIGHT!". 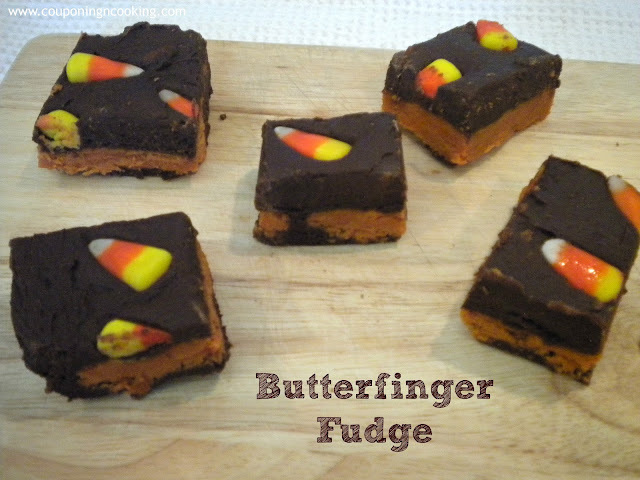 So all these amazing, talented, chocolate dipping savvy food bloggers kept making posts about turning candy corn and peanut butter into Butterfingers and I kept doubting them. But as bags of candy corn started making their way onto store shelves and displays for Halloween, I could no longer resist temptation. I just couldn't bring myself to make the real version where you dip the Butterfinger mixture into chocolate so I took a different route and went with fudge. Just pouring, no dipping. I made this fudge for a family football game watch and while it was on the counter warming up from being in the freezer to set my family slowly started hacking away at. It was basically frozen solid yet they were sneaking up on it with a butcher knife and slicing off what they refer to as "snigglets" and thinking that I wouldn't notice. It's a miracle that there was even anything left photograph. I even got jealous text messages from my mom about how my aunt supposedly got to take home a bigger piece than she did. And if you know my family, you know that we don't mess around when it comes to dessert. So next time I will use a ruler when measuring out my family's take home fudge portions. 1.) Foil and grease a 9x13 pan. Let me preface this recipe by saying it was a little nerve racking since you basically have to make your fudge and the butterfinger mixture at the same time. I had two pots going on the stove at the same time and I also enlisted the help of my lucky sous chef, Justin. 2.) In a double boiler, melt the chocolate. While this is starting to melt, beat together the other ingredients used in making the fudge. Once the chocolate is completely melted you will need to beat that into the rest of the ingredients until fully incorporated. 3.) Melt candy corn in a sauce pot on medium-low heat. Once candy corn turns to a liquid like goo, lower heat and mix in the peanut butter. Make sure to fully mix the peanut butter into the candy corn mixture or you will end up with some very bright orange sections. 4.) This is where it gets tricky. You should try to have your fudge and your butterfinger mixture done around the same time because if either cools too much it can become stiff, grainy and hard to work with. Pour a layer of fudge in the pan and spread evenly. 5.) Pour all of the butterfinger mixture on top of the bottom fudge layer and smooth out completely over the chocolate. Top with the rest of the fudge and smooth out. I topped part of mine with left over candy corn for texture and fun. 6.) Cool in the fridge or freezer before cutting into squares and serving. Any leftovers should be stored in an airtight container in the fridge. But if your family is anything like mine, you won't have to deal with any storage issues. OMYGOSH...these look sooo delicious. Thanks for sharing...will try it soon. I didn't know you could melt candy corn! This looks really delicious. You had me at Butterfinger! ;) Looks so yummy!!! they look delcious. You cantbuy candy corn here, and Im not really sure what would be comparable. Is there anything that would work as a replacement? These are awesome!! I still see homemade Butterfingers on Pinterest and I'm still doubting! I have one bag of candy corn, and now after seeing these, I'm determined to try them! I love that you turned them into fudge! WOW!!! these look sooooo incredible!! Found you though the Sunday Funday hop and love your blog! 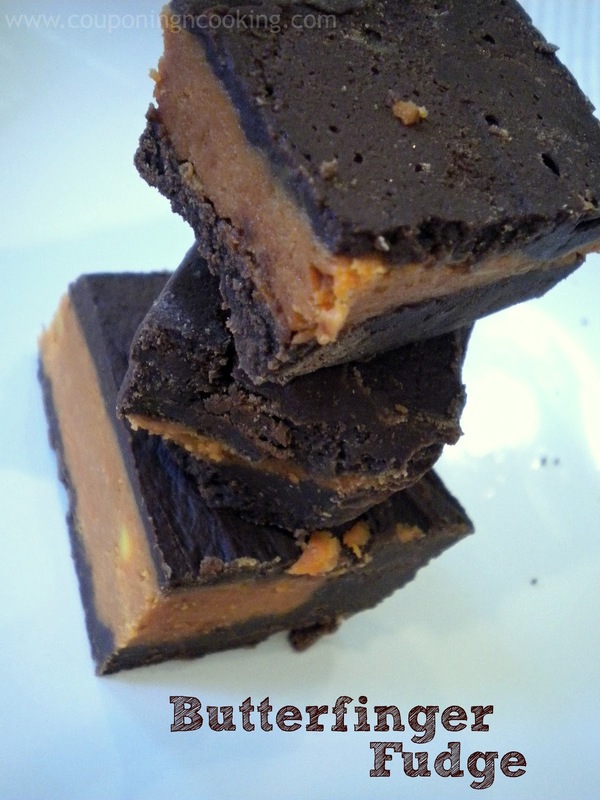 Your Butterfinger Fudge will be a great hit at our cottage. Have a fabulous weekend and thank you so much for sharing with Full Plate Thursday. OMG! That looks amazing! Looks like fun melting the candy corn. :::drool::: wow, that looks amazing! This is so creative! Love the idea, bet it tastes heavenly! Thank you so much for linking up to Sunday's Sweet Confessions over at mommy's sweet confessions! Have a great day! Yum! I didn't even need a picture, just the ingredients do it for me. Thanks for sharing on "I Gotta Try That"
Wow this sounds amazing! I love anything with Butterfinger and of course fudge! Pinning this! Your family fighting over the leftovers totally cracked me up! Congratulations! I love your idea so much that I will be featuring it on OneCreativeMommy.com later today. Please stop by and grab a featured button if you’d like. I hope you’ll be back to share more great ideas at One Creative Weekend tomorrow. 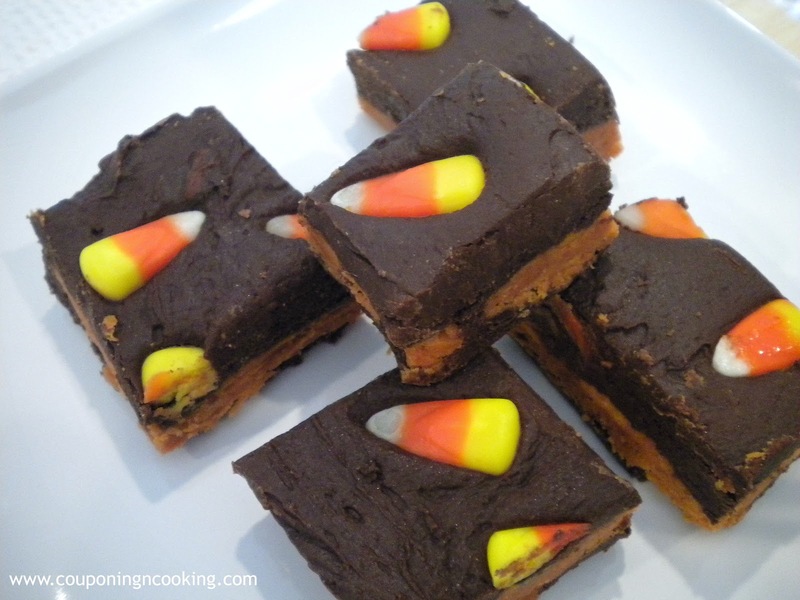 I'm such a bad hostess, just now popping in to let you know that I love this fudge and just bought more candy corns (on sale) this morning so I can make some of this. I've featured you this week and Pinned! 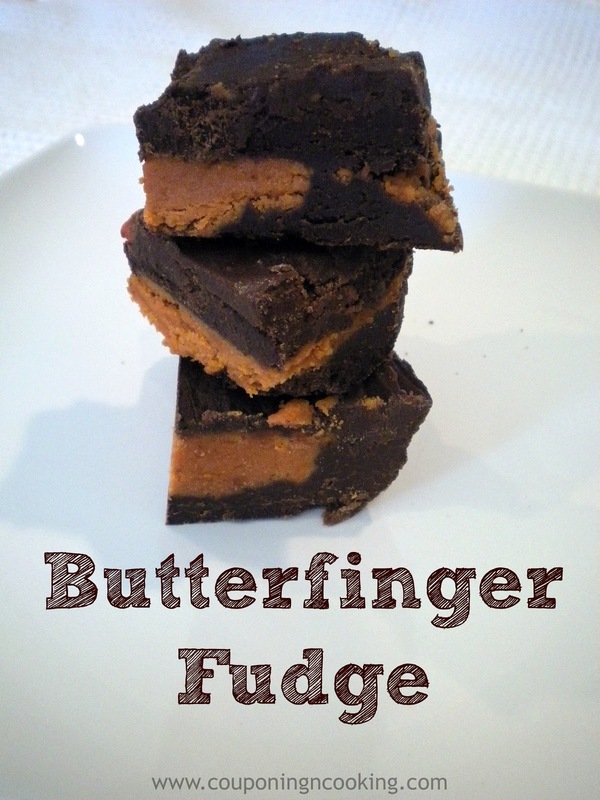 I just made, and blogged about, the Butterfingers, but I like the fudge idea better!! I know you've gotten tons of features on this recipe but you've got another ;) You're one of the features for Mom's Test Meal Mondays this week!! You were one of the most clicked for last week's Tasty Thursday: http://fantasticalsharingofrecipes.blogspot.com/2012/11/tasty-treasures.html Thank you for linking up! I hate candy corn, but love butterfingers! Now I know what to do with that unopened bag of candy corn in my pantry!!! We love Butterfingers in our house! After Halloween we had an entire bag left over (that may or may not have been on purpose) and I have been keeping them in the garage freezer to slow myself down. It's not working! I'll have to try these. Thanks for sharing over at Fabulous Fridays! This looks so delicious! I love making fudge but have never tried making it with cream cheese! Yes! It really does work, haha. I made the homemade butterfingers recently.